Hummus And Hemp Seeds Pita Pockes are bursting with all 10 essential amino acids and over 3 grams of protein per tablespoon. Boil ½ cup of water and add cooked chickpeas, garlic and boil for one minute. Remove from heat and coarsely mash. Stir in the hemp seeds, lemon juice and season with salt & pepper. Combine the cucumber, tomato, pepper, parsley, green onion and lemon juice in a small bowl. Season with salt and pepper, if desired. 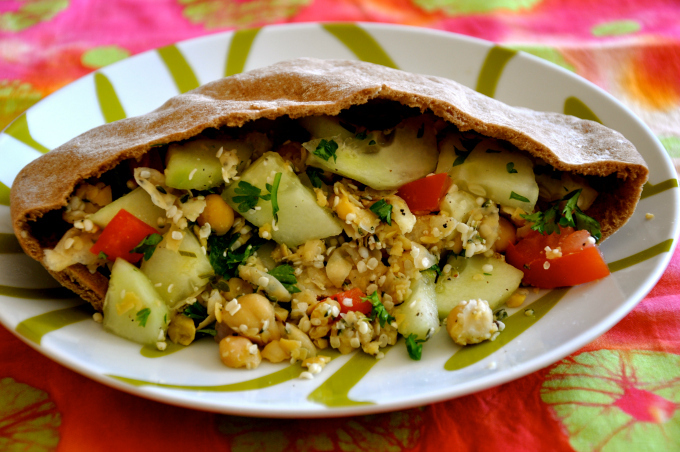 Fill ½ whole-wheat pita with ⅓ cup hummus and ½ cup cucumber salad. This recipe fist appeared here.